Arianespace has successfully launched the Hellas Sat 3-Inmarsat S EAN “condosat” – composed of two payloads for operators Hellas Sat and Inmarsat; as well as the GSAT-17 satellite for India’s space agency, ISRO (Indian Space Research Organization). The launch took place on Wednesday, June 28 at 6:15 p.m. (local time), from the Guiana Space Center (CSG), Europe’s Spaceport in French Guiana (South America). 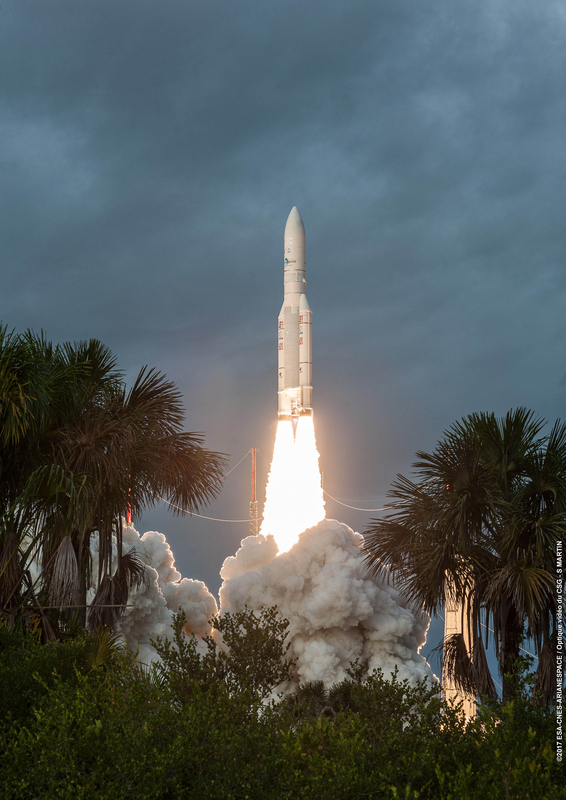 With this seventh launch of the year, and the fourth by Ariane 5 in 2017, Arianespace marks the 80th successful launch in a row by this heavy launcher. Hellas Sat, a major satellite operator and subsidiary of Arabsat Group, provides communications services in Europe, the Middle East and South Africa. The Hellas Sat 3 payload, the second for the operator Hellas Sat and the first to be orbited by Arianespace, will expand the company’s business reach by providing direct-to-home (DTH) TV broadcast and telecommunications services, as well as the distribution of high-definition (HD) and ultra-high definition (UHD) video content in Europe, the Middle East and sub-Saharan Africa. These fixed satellite services (FSS) and broadcast satellite services (BSS) will include a cross-strap service between Europe and South Africa. 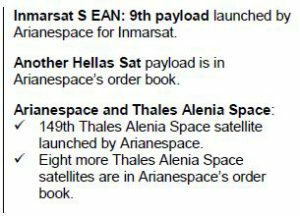 Arianespace has another Hellas Sat satellite – Hellas Sat 4 – in its order book. This spacecraft will further increase the operator’s service availability. Inmarsat S EAN is the ninth payload orbited by Arianespace for Inmarsat – a company specialized in global mobile satellite communications – since the launch of MARECS A in 1981. The Inmarsat S EAN (European Aviation Network) payload comprises the space segment of a new hybrid system, integrating satellite-based services with a complementary ground network developed by Inmarsat’s strategic partner Deutsche Telekom. The EAN network, which will commence commercial services in the second half of 2017, will deliver a truly seamless inflight WiFi service for Europe’s airlines and their passengers. The International Airlines Group (IAG), is confirmed as the launch customer for the new service. IAG has begun equipping its aircraft and aims to have 90% of its short haul fleet complete by early 2019. Following the launch of GSAT-18 on October 5, 2016, GSAT-17 is the 21st satellite orbited by Arianespace for the Indian space agency ISRO (Indian Space Research Organization). 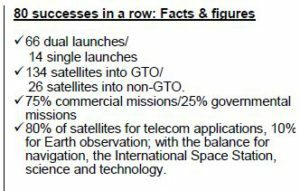 Arianespace has won nearly 90% of all Indian geostationary satellite launch contracts open to competitive bidding. GSAT-17 will join ISRO’s fleet of 17 operational telecommunications satellites. It will provide both fixed (FSS) and mobile (MSS) satellite services, and also handle data transmission and search & rescue (SAR) services. It carries on ISRO’s mission of using space to support the development of the Indian sub-continent by launching satellites of all types (Earth observation, telecommunications, educational program broadcasting, science, navigation, etc.). Arianespace’s order book includes another ISRO satellite to be launched: GSAT-11. Today’s Flight VA238 mission was the 80th successful Ariane 5 launch in a row, a string of successes that started in 2003. Over the last 14 years, the Ariane 5 launcher has orbited 160 satellites for both commercial and government customers, exceeding 677 metric tons. This enviable track record reflects the exceptional reliability and availability of Arianespace’s heavy-lift launcher, and confirms its status as the most reliable launcher on the commercial market today. 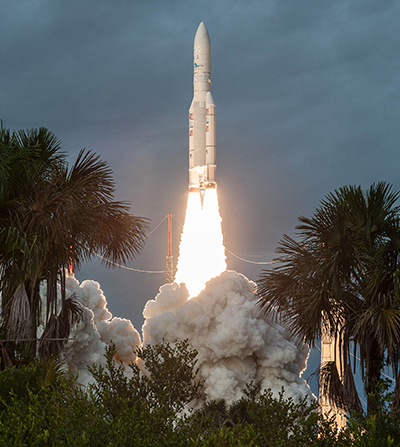 Including this mission, Arianespace has now carried out seven launches over a period of five months and a day in 2017, sending 10 satellites into geostationary transfer orbit (GTO) and one into a non-GTO orbit, with a cumulated payload weight of nearly 45 metric tons. Arianespace plans five more launches in 2017: three by Ariane 5 and two by the Vega light launcher. The Hellas Sat 3-Inmarsat S EAN satellite was built by Thales Alenia Space in Cannes, southern France, using a Spacebus 4000 C4 platform. The Hellas-Sat 3 payload will provide secure DTH TV broadcast and telecommunications services using 47 (BOL)/44(MOL) transponders in Ku band and one Ka-band transponder. The Inmarsat S EAN payload, operating in S-band for Inmarsat S EAN, will provide communications services for in-flight connectivity via the European Aviation Network (EAN), which combines space and ground segments to provide robust and reliable high-speed services to European passengers. Positioned at 39° East, its coverage zone spans Europe, the Middle East and sub-Saharan African regions. The satellite had a liftoff mass of 5,780 kg., and it offers a design life exceeding 15 years. The GSAT-17 satellite was built by ISRO/ISAC (ISRO Satellite Center) using a Standard I-3K platform. Its payload comprises C-band, Extended C-band and S-band transponders, as well as data relay and search & rescue (SAR) services in UHF band. Positioned at 93.5° East, GSAT-17 will provide fixed and mobile communications services, data transmission and search & rescue (SAR) services for India, the Middle East and regions of Southeast Asia. The satellite had a liftoff mass of 3,476 kg., and offers a design life of approximately 15 years.